Autodesk Vault. Manage documentation, and track revisions. NEED TO IMPROVE DESIGN DATA MANAGEMENT AND SECURITY? Almost every organisation develops, or is accountable for protection of, intellectual property (IP). Security of your own and business partner digital data and IP is not only important, it is a corporate fiduciary duty. To facilitate this need, Modena OneSolve offers the OneSolve Vault Adoption Programme™, a unique and robust solution built around Autodesk Vault and a range of OneSolve Vault Extension Modules, that not only ensures that all digital assets are stored in a secure central data store, but also promotes and facilitates inter-disciplinary and inter-departmental collaboration. The solution ensures that data cannot be accidentally deleted or overwritten – with the option to ‘roll-back’ to a previous version if changes are made in error. Customised approval workflows; transmittals; and activity audit trails ensure full accountability for revision level changes or releasing of designs to the next stage. WANT TO BETTER MANAGE THE BUSINESS? The pressure to deliver quality projects on time and on budget is driving the need for improved real-time collaboration within workgroups; amongst multi-disciplinary departments; with other project stakeholders; and amongst different geographic locations. Real-time collaboration is dependent on effective access to, and management of, design and engineering data and documentation – as well as timeous business intelligence to underpin decision-making. The OneSolve Vault Adoption Programme™ not only secures design data, but promotes productivity and provides project participants with easy access to current and previous project data and designs. To minimise errors and rework, all project participants are assured of access to the latest/correct design models/drawings. The solution also enables real-time data communication, collaboration and, if necessary, compliance with international Building Information Modelling (BIM) standards. From simply securing and managing your design data; to improving collaboration; through to implementing a full Product Lifecycle Management (PLM) process; the OneSolve Vault Adoption Programme™ is designed for you. The solution is modular and can be implemented in stages over time if desired. 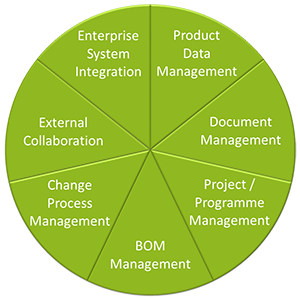 Start with Product Data Management (PDM); add management and collaboration processes to improve quality and reduce waste; or integrate with enterprise technologies such as ERP or MRP to build a customised end-to-end PLM solution. The choice is yours. Promote productivity by providing designers and engineers with easy access to current and previous design data. Minimise errors, rework and waste by ensuring that all stakeholders have access to (and use) the latest/correct design and manufacturing data. The pressure to cut costs and better manage and maintain plants, buildings, mines and other facilities is driving owner / operators to better manage their design and engineering data and improve collaboration amongst the various stakeholders involved. There is also the need to reduce business risk and the risk of health and safety issues by ensuring that there is a ‘single source of truth’ for engineering data that matches the reality in the facility. The OneSolve Vault Adoption Programme™ not only secures design data, but ensures that all asset managers and maintenance teams have access to (and to use) the latest/correct design drawings and 3D digital models. Similarly refurbishment or expansion project participants are assured of access to the latest/correct design models/drawings to minimise errors and rework. If necessary, the solution can be integrated with enterprise technologies such as ERP and EAM, and ensure compliance with international Building Information Modelling (BIM) standards. WHY THE OneSolve VAULT ADOPTION PROGRAMME™? We have all heard the horror stories of organisations that invested in IT systems that apparently ‘did not work’. In reality, what that usually means is that the focus was on the technology, while the implementation, training and adoption processes were ignored or failed – resulting in lack of adoption by the organisation at large. The OneSolve Vault Adoption Programme™ includes a suite of customisation, skills development and adoption services that ensures the successful implementation and adoption of an Autodesk Vault-based solution – thereby protecting your investment and ensuring realisation of significant business benefits. The OneSolve Vault Adoption Programme™ ensures a common platform for managing people, processes and technology during design or engineering projects; effective collaboration across extended teams; the automation of business processes; and the timeous availability of meaningful business intelligence.